Ipsos MORI’s monthly political monitor is out, with topline figures of CON 27%(-3), LAB 40%(-2), LDEM 11%(+4), UKIP 13%(+4). It suggests a boost for the Lib Dems and UKIP in the aftermath of Eastleigh, but little difference in the Labour lead (most of MORI’s polls in the last few months have shown this degree of lead). MORI also have some economic questions in advance of the budget. George Osborne’s approval rating remains strongly negative – 60% are dissatisfied with how he is doing compared to only 27% who approve. As with most recent polls, MORI show Labour and the Conservatives pretty much neck-and-neck on the economy. 26% think that Labour have the best policies, 27% the Conservatives. Asked if a Labour government under Miliband and Balls would do better or worse than the current government at running the economy 26% think they’d do a better job, 31% a worse job and 38% think they’d do much the same. Interesting graph. I hadn’t picked up on that marked change in approval figures. So, what happened last week of January? 2012 Q4 GDP figures were out on 25 Jan. Can’t think of owt else major off the top of my head. I would be thinking woohoo I’m rich ! But I take your point – where would you go to be safe? Probably a German or US bank. The average decline in approval starts around early February (4th-6th), so it could be due to GDP figures and other bad news (Horsemeat scandal, businesses going bust, Tory party infighting, etc), but as always you can’t be exactly sure what the cause of these sorts of issues are. We can only be certain that since early Feb, on average, government approval has declined to levels not seen since October 2012. Although if it does continue to decline ( it may not be, it might be levelling out – big emphasis here – and it may also go in to recovery, depending on the budget – big emphasis here ), government approval may fall to it’s lowest recorded levels. 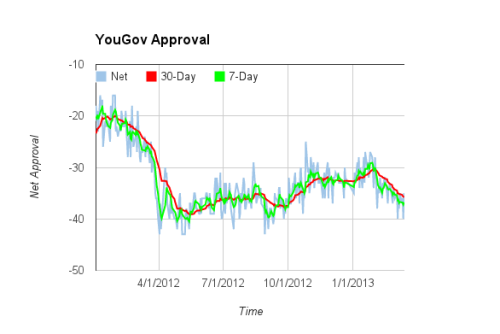 Approval since Jan 2012 – the ‘budget collapse’ looks rather clear. I should perhaps point out the obvious – because these figures are based upon weighted averages, the more data you use the slower they are to notice changes in trends. So the 7-day average will take time to notice and trend change and the 30-day will take even longer (as you can see in the Jan 2012-Now chart), but they’re semi-useful for determining longer-term trends from the raw data (a quick example – during one of Miliband’s bounces, the 30-day weighted average completely ignored it, since the bounce was so short). My method is really crude compared to StatGeek’s method though – I just don’t have the effort to recreate what StatGeek has done. Gosh you have just freaked me out. I have three daughters , oldest is fourteen and I worry so much about what they do on line. I work away from home and my wife is not computer savvy at all. I have tried to set filters and block things using the inbuilt facilities but what you have just described there makes think I fighting a loosing battle. I will spend the weekend reading up on how to improve the online security now. I’d recommend http://www.hightechdad.com and http://www.bewebsmart.com for starters. And have a detailed conversation with the kids about exactly what sites they use and/or have accounts for. I think he means people who aspire to be able to pay for those things themselves…. Well, two of your three examples (having children and bedrooms) are not really ladders for aspiration. They are rather the aspiration itself, which was my point. I think the idea is that people study hard, work hard and then achieve an income that allows them to have children that can benefit from the fruits of that labour, rather than filling out a few application forms and having the government allocate the fruits of someone else’s labour to them. You’re quite right of course that his speech is meaningless unless he can point to some actual “ladders”. A difficult trick in the current fiscal climate. I suppose he might point to things like school reform, but of course you won’t agree with him on that. Not sure how much money can be transfered to german banks or british ones for that matter, a lot of capital flight has already occurred surely there ain’t that much left. The capital flight figures for the club med countries has been phenomenal making their problems worse while at the same time making other economies. Look much much better. Indeed german and british banks have been encouraging. This movement of funds to improve their capital ratios. The free movement of capital is a really dangerous idea!! Hmm.. I’m not really talking to myself…. where did Amber’s posts go?? Dangerous, perhaps.. but what’s the alternative, and is it less scary? A return to exchange controls? I thought they were reasonable & not as partisan as some comments which don’t get binned; but Anthony didn’t think so. So, taking yourself as an example. Wasn’t it the LA which paid for your scholarship? Didn’t you get that as a result of aspiring to fill a form & apply for a government funded ladder of opportunity? Hmm, hate to tangle with the Big Guy but I rather agree. I think when a leader makes a big political speech in the middle of a polling slump then it’s only fair to dissect the realite of his message to see if it stands up to scrutiny. Absolutely. And I am very greatful for the Tory council providing me with that wonderful ladder, and rather sad that the subsequent Labour council removed it for disadvantaged Enfield children of the next generation. Happily, having had the advantage of that ladder I can now afford a bedroom each for my children without recourse (other than child benefit) from the state. Win win! I did think that I was picking up on Cameron’s big speech; about how it will be perceived by some of the public & what the effect of rhetoric without supporting policies will be. We see yards of debate on here about Labour having no policies to support their rhetoric & they are in opposition! To say that the government does not have policies to support its big themes seemed fair to me. I probably should have chosen the way I worded it more carefully. Not at all, but if it’s ok I’ll do it after tomorrow’s poll. Busy right now. Also it will be in .xlsx format, as it currently inhabits 338 columns, which is too many for the 97-03 .xls format. Exactly. It seems to me that the Tory Party, with their school, university & business connections should be in a superb position to provide ladders! That they might not be ladders of which Labour would approve surely adds to the incentive. But there seems to have been too little encouragement of such initiatives by the government. An Eton for every child, I think was mentioned in the run up to the 2010 election. Are we any closer to that aspiration than we were three years ago? Cyprus is a very small economy in the scheme of things, but I can’t help feeling that we’ve just witnessed the biggest disaster yet to have fallen the European (and global) economy so far in this crisis. I really don’t know what the ramifications of the Cyprus bail out will be, but by punishing savers for the behaviour of the banks, I can’t help feeling that they have just sealed the deal on the next run on EZ banks. Everything revolves around confidence, and if savers in troubled economies begin to get the slightest hint that they are set to arbitrarily lose 6.75% or 9% of their entire savings, I can foresee rapid and terminal stresses swamping the banking system. Clearly they are gambling that they other EZ hotspots have been sorted out, but the EU’s record on this has not inspired confidence, and I find it deeply troubling that such a grab on bank savings has been made. Yup that’s what’s worrying me. Not especially bothered about the financial health of people with large bank accounts, but very concerned about the health of the banks they lodge them with. Ah, that’s where you are. Sad to hear you’re only lurking but glad to hear that it’s nothing more tragic than dissatisfaction keeping you away! Well if this isn’t a site for debate we need one that is, unfortunately the sites that are for debate have very little debate and rather a lot of mud slinging. I think an element of debate is inevitable when you’re talking about polls, otherwise it’s like speaking only nouns and missing out the other words. I think the tone is the thing. We all (and I am as bad as anyone) have to avoid the sneery, partisan gloss that tends to get applied to some comments. It just agitates and provokes dumb responses. Heat and light signifying nothing. Well done! In Orwellian world you need to get to read my posts quite quickly. Still enjoying your contributions by the way – very level-headed I think. If you see your government racking up unsustainable debts, and your banks being accused of largescale money laundering-keep your money in some other country. If you are a small EZ country & get into debt-you have no leverage at all. You do as you are told by your financial saviours. In a heartbeat. But it would be as part of a wider “legal asset” law. Any UK asset would have to be owned by an entity in a jurisdiction certified by the UK government as “Clean” – otherwise it would be subject to confiscation by the authorities. (And by “Clean” I mean that if a court asks you for details of ownership, they can be provided – clearly and unambiguously – and shown to be legitimate). Ahh we are almost on the same page apart from the cayman islands which I still think should be nuked. Yes, I think the education reforms are going very well. Yes full marks to Wales, solid in defence and clinical in attack. We had a poor day at the office as I rather suspected we would. England are a young side and there is much still to do to make them a really good side capable of competing with the Southern hemisphere teams. Of to watch Scotland & France. I enjoyed the Italy win-I really like them. They deserve their two wins this year. Enough rugby for one day-await the last of this series of Spiral later.